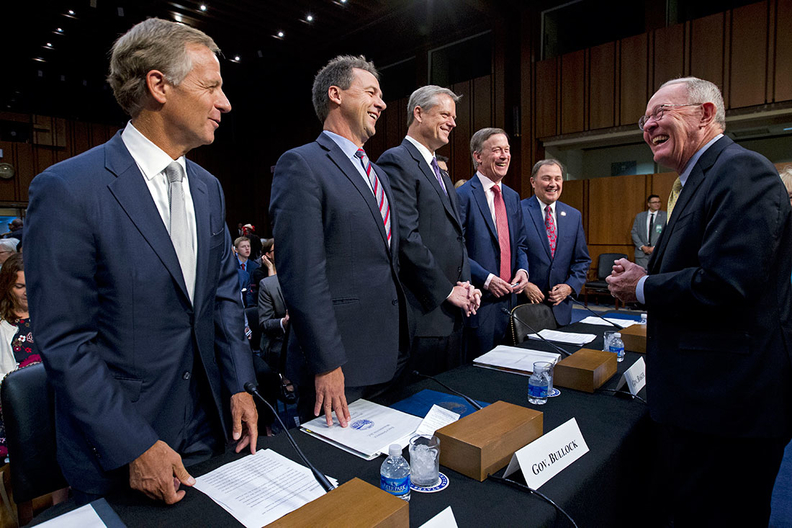 Governors from left; Bill Haslam of Tennessee, Steve Bullock of Montana, Charlie Baker of Massachusetts, John Hickenlooper of Colorado and Gary Herbert of Utah are greeted by Senate Health, Education, Labor, and Pensions Committee Chairman Sen. Lamar Alexander, R-Tenn., right, during a hearing to discuss ways to stabilize health insurance markets, on Capitol Hill in Washington, Thursday, Sept. 7, 2017. A group of Republican and Democratic governors on Thursday implored senators to continue paying insurers for cost-sharing reductions to shore up the unstable exchange markets. Three Republican and two Democratic governors told members of the Senate's Health, Education, Labor and Pensions Committee that paying cost-sharing reductions is the most important thing they can do to prevent premium spikes and insurer exits. The recommendation came just one day after several state insurance commissioners called for at least two years of guaranteed cost-sharing payments. Utah Gov. Gary Herbert, a Republican, recommended Congress approve the CSRs through 2019 even though he feels they aren't the most effective way to help low-income individuals. The proposal is gaining momentum with lawmakers. Sen. Lisa Murkowski (R-Alaska), a swing vote who helped kill a partial repeal of the ACA, said what matters on appropriating money for CSRs is that both parties agree it should be done. "Whether it's one year, two years or perhaps longer, we can figure that out," she said. The committee is trying to pass a narrow bipartisan bill by Sept. 15, so a law can be signed before insurers have to commit on Sept. 27 on where they'll sell policies and how those policies will be priced. "It sends a signal to the country (that) we've broken the seven-year stalemate" since the Affordable Care Act, committee Chairman Lamar Alexander (D-Tenn.) told reporters at the end of the second of four hearings for the bill. The Affordable Care Act passed seven years ago with no Republican votes, and members of the party—including Alexander—repeatedly vowed to repeal the law. CSRs have had a substantial impact on proposed 2018 rates, with some insurers requesting double-digit increases due to the unknown fate of CSRs. The Congressional Budget Office has projected that premiums will increase by 20% next year without guaranteed CSRs. The Republicans in the House of Representatives sued over the CSR payments, saying the executive branch violated the separation of powers by funding them. A federal court sided with the House and the case is now on appeal. Until the appellate decision is made, the Trump administration has continued to pay the CSRs, while repeatedly threatening to stop. If Congress appropriates the money now, the lawsuit—and Trump's threats—will become moot. The governors' requests for renewed federal reinsurance funding drew less support. Although the governors said their states cannot raise money quickly enough to provide reinsurance to offset high-cost patients' care, Alexander said that would have to wait for a longer-term solution. "Creating a brand new reinsurance pool in the next 10 days is just not going to happen," he said. "There isn't any way to do that." The CMS said in June that issuers requested $7.5 billion in federal reinsurance payments for the 2016 benefit year, the last year transitional reinsurance was funded in the law. The federal program covered about half of the cost of claims between $90,000 and $250,000 a year for any individual who had more than $90,000 claims that year. Alexander noted that both Republicans and Democrats on the committee have asked whether opening up catastrophic plans—also called copper level—to all customers might convince more people to get covered, and thereby help the risk pool. Giving customers more choice appeals to Republicans and may be part of a compromise bill.